Since 1890, the best wheat has been one chosen by Divella to make its soft wheat flour and durum wheat semolina for the different types of pasta. 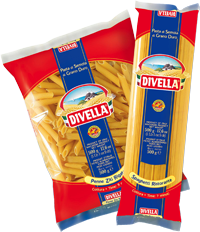 Divella also has a variety of products to complement their range of pasta with canned tomatoes, passata and sauces, as well as a variety of rices from Arborio to Carnaroli plus ever versatile Couscous. Try it for your family meal today. For over five decades we’ve been bringing Italian culinary passion and flair to North American tables. It’s a long story but from a single item – espresso coffee – we’ve grown to represent a number of leading Italian brands and products. Our longevity tells us we’ve been living up to our goals. With hard-work and dedication to our goal we hope to bring Italy to your table for the next fifty years.